With Korakuen in the rear window, Stardom’s next stop is the good old US of A. Before they get there, though, they’ve got a stop over in Niigata with what, on paper, looked like a pretty straightforward card. Let’s see if they can surprise us. Natsu lost to Saya Iida at Dream Slam, so it made sense for her to avenge her defeat against one of Iida’s peers. The action was about what you’d expect, with Sumire never being likely to lead the inexperienced Onozaki to anything more than an okay match. There was one slightly awkward spot, but it wasn’t lousy. It was just there. Any excuse to hear Kashima’s banging theme is alright by me. If anyone can tell me what that song is and where I can get a copy, I’d be eternally grateful. In the ring, this was fine. The sisters have their match, and they do it well, but at this point, I’ve seen it before. While I don’t begrudge them that at this stage in their development, it is hard to get enthusiastic about it. Kashima single-handedly beating down the twins was fun enough that it was at least a bit better than the opener. Is there a wrestler on the planet cooler than Kagetsu? The image of her chilling out in the ring, doing a few poses, while the rest of Oedo Tai dragged JAN around the venue beating them up was brilliant. She’s got charisma to burn. After that break, Kagetsu worked the bulk of this match despite coming off a pretty gruelling showdown with Goya Kong. She spent a lot of time in the ring with Iida, putting the rookie through her paces, and there was a lot to enjoy about their interactions. A description which could extend to this match as a whole with six wrestlers appearing to go out there to put on the most enjoyable bout they could. There wasn’t anything fancy about it or a deep storyline to follow, but it was fun wrestling that will leave you with a smile — the perfect performance for this kind of show. Goya Kong and Viper fought to a count out on the show before Korakuen, so there was bad blood between those two already. However, their confrontation would turn out not to be the story of the match. While they kicked things off together, their interactions were kept surprisingly limited. Instead, the main confrontation turned out to be Kong vs Kel. It started with Kel accidentally dropkicking Goya and was followed up by Kong returning the favour with a splash after Viper rolled out the way. From there they seemed incapable of not catching each other, and when Kong got pinned after a Vader Bomb from Viper, Rebel was not happy. Post-match they had to be dragged apart as they decided they’d rather fight each other. Truthfully, this was a bit of a nothing match as it built to the post-match angle, but that altercation was quite fun. Viper is heading home, so it makes sense to transition Goya Kong onto feuding with someone else, and this will be a chance for the imports to show what they can do together. I think I will die happy if one day I get to spin around in a rain of streamers like Mayu Iwatani. Sadly, I can’t imagine a situation where that will ever happen maybe if I wish extra specially hard. There were a lot of lovely combinations in this one. 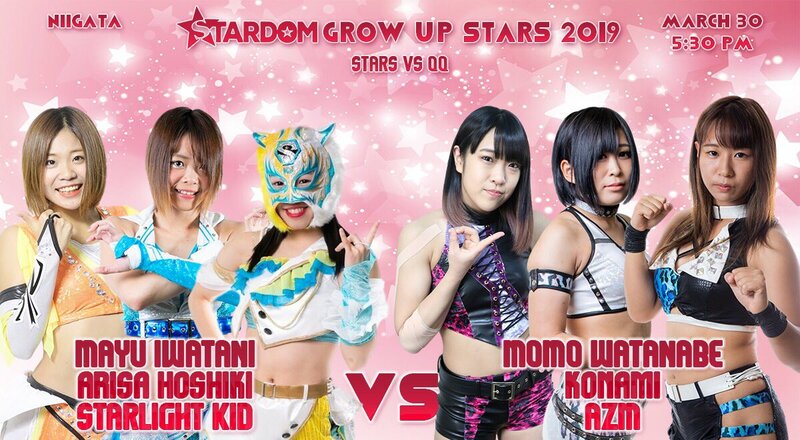 AZM vs Starlight Kid is always a banger, Konami and Hoshiki had great chemistry and that’s before you get to the Momo vs Mayu showdown. Every time someone tagged into the ring you had the potential for great wrestling, and they delivered more often than not. Of course, this was a multi-women tag on a smaller show, so you weren’t getting the best of those combos, but even working a bit below their peak, these wrestlers deliver the goods. Plus, you had all the more unusual combinations. Hoshiki and Momo had a fun interaction while Mayu vs Konami proved a natural fit. Like the Oedo Tai vs JAN match, you got the impression they were going out intending to put on a show. In that sense, they delivered. An entertaining if somewhat forgettable show. If you’re looking for storyline developments, you’re going to be left disappointed as the only hint of that came from Goya and Rebel. It was fun, but if you want to give it a miss. you can.